The story of historic churches in Texas is the story of the Anglo-American and European immigrants in Texas. It is the story of the struggle of three cultures trying to coexist in an empty and often hostile land: the Native Americans, the Mexicans, and the immigrants. It is the story of circuit-riding preachers tirelessly, clandestinely crisscrossing Texas, bringing the Protestant word of God to the people in a land where, prior to Texas's independence, only Catholicism was legal. It is the story of a people who successfully fought and won their independence to build a nation. It is the story of Texas. Over the past ten years, my wife and I have visited and photographed almost one thousand historic churches in Texas. We have seen stunningly beautiful stained-glass windows, listened to the rich tones of Texas's largest organ, and prayed in the smallest active Catholic Church in the world. We visited the oldest Polish church in the United States in Panna Maria, lingered with spirits in an abandoned church in Nacogdoches, and were dazzled by the bright colors and designs found in the Catholic Cathedral in Beaumont. In Berlin, we held a silver communion cup donated to the church in 1889, and in San Antonio we touched the sarcophagus where the remains of Alamo heroes William Travis, David Crockett, and James Bowie are said to be kept. 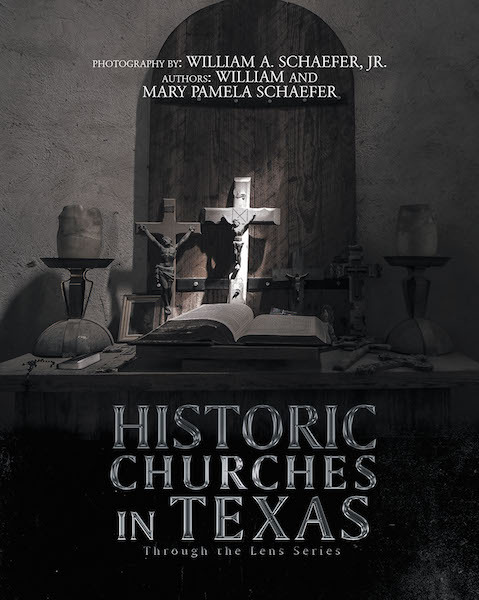 The photographs and text, which was jointly written by William and Mary Pamela Schaefer, are attempts to capture the important history and the quiet beauty of the 186 historic Texas churches presented in this book.